Gentile Bellini, a member of Venice's leading family of painters in the 15th century, died in Venice on this day in 1507. He was believed to be in his late 70s, although the exact date of his birth was not recorded. 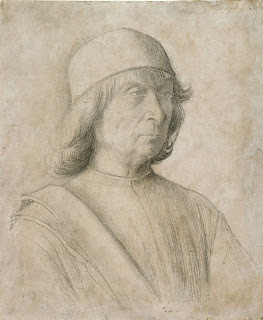 The son of Jacopo Bellini, who had been a pioneer in the use of oil paint in art, he was the brother of Giovanni Bellini and the brother-in-law of Andrea Mantegna. Together, they were the founding family of the Venetian school of Renaissance art. Although history tends to place Gentile in their shadow, he was considered in his time to be one of the greatest living painters in Venice and from 1454 he was the official portrait artist for the Doges of Venice. He also served Venice as a cultural ambassador in Constantinople, where he was sent to work for Sultan Mehmed II as part of a peace settlement between Venice and Turkey. Gentile learned painting in his father's studio. Once established, he had no shortage of commissions, for portraits, views of the city, and for large paintings for public buildings, often characterised by multiple figures. He was one of the artists hired by the Scuola Grande di San Giovanni Evangelista to paint a 10-painting cycle known as the The Miracle of the Relics of the Cross. 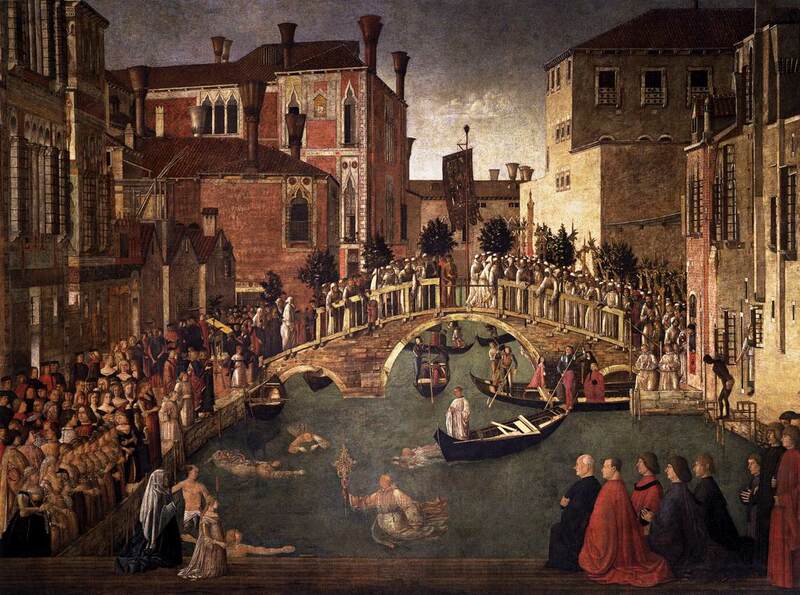 His contribution included the Procession of the True Cross in Piazza San Marco (1496) and the Miracle of the True Cross at the Bridge of San Lorenzo (1500), which includes a self-portrait and a portrait of his brother, Giovanni. Gentile was despatched by the Venetian senate to Turkey in 1479. Mehmed II had been interested for many years in the art and culture of Italy and one of his life's wishes was to have his portrait painted by an Italian. It is certain that Gentile would have executed at least one, possibly more. The portrait of Mehmed in the National Gallery has for many years been attributed to Gentile, although there are some who question that assumption. His painting Saint Mark Preaching in Alexandria, which was completed by Giovanni after Gentile's death, has an Oriental flavour influenced by his time there. Saint Mark, the patron of Venice, was from Alexandria. Back in Venice, Gentile Bellini was an early teacher of Titian, although they were said to have had a difficult relationship and Titian found his adherence to conventions somewhat restricting. He is said to have preferred to learn from Giovanni, although soon afterwards he went to work with Giorgione. Some 70 years after his death, a large fire at the Doge's Palace in Venice destroyed some of Gentile's most notable work, although there are several examples preserved in galleries around the world, notably in the United States and in London as well as Italy. Saint Mark Preaching in Alexandria is in the Pinacoteca di Brera in Milan, while the Procession of the True Cross in Piazza San Marco and the Miracle of the True Cross at the Bridge of San Lorenzo can both be found in the Gallerie dell'Accademia in Venice. 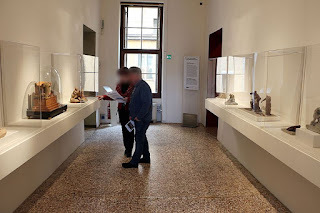 Two of his portraits of the Doges - of Giovanni Mocenigo and Leonardo Loredan - are housed in the Museo Correr in Venice. Another in the series, of Pasquale Malipiero, is in the Museum of Fine Arts in Boston. The Frick Collection in New York has another portrait of Giovanni Mocenigo; another of Leonardo Loredan can be seen in the Young Memorial Museum in San Francisco. 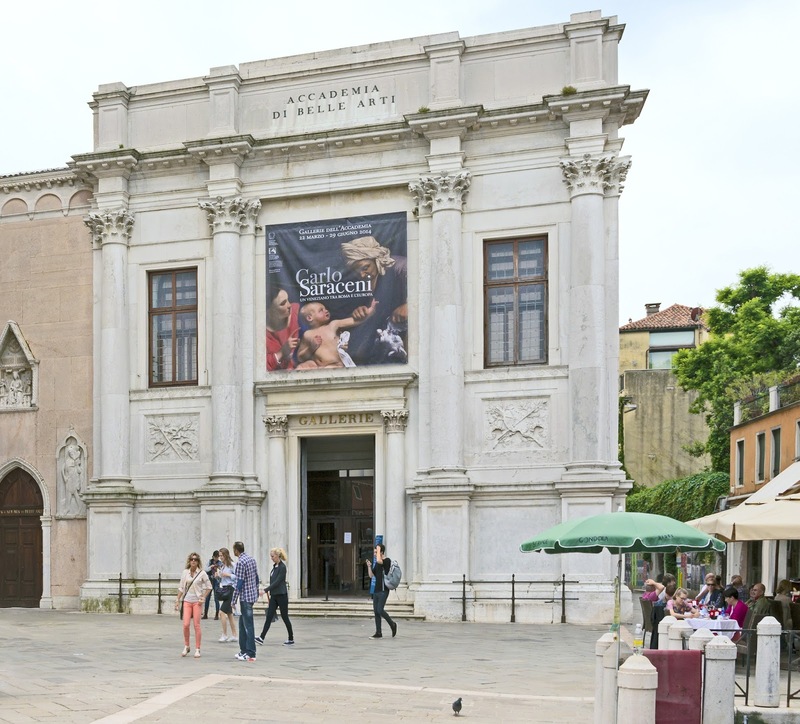 The Gallerie dell'Accademia in Venice is housed in the Scuola della Carità on the south bank of the Grand Canal, in the Dorsoduro district. It evolved from the gallery of the Accademia di Belle Arti di Venezia, from which it became independent in 1879. The church of Santa Maria and the monastery of the Canonici Lateranensi, built by Andrea Palladio, are integral parts of the Accademia. As well as works by Gentile and Giovanni Bellini, its collection includes paintings by Canaletto, Carpaccio, Guardi, Giorgione, Longhi, Lotto, Mantegna, Tiepolo, Tintoretto, Titian, Veronese, Vasari and Leonardo da Vinci. Opening hours are 8.15am to 2pm on Mondays, 8.15am to 7.15pm on Tuesday to Sunday. Venice's Museo Correr is located on the south side of Piazza San Marco (St Mark's Square) on the upper floors of the Procuratorie Nuove. 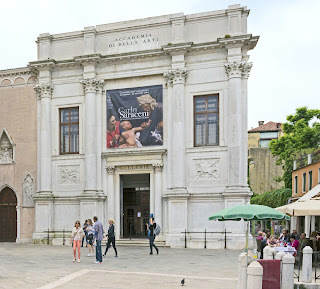 The museum originated with the collection bequeathed to the city of Venice in 1830 by Teodoro Correr, a member of a prestigious Venetian family who dedicated most of his life to the collection of works of art, documents and objects that reflected the history of Venice, which he donated to the city after his death. Museo Correr is open from 10am to 5pm from November 1 to March 31 and from 10am to 7pm from April 1 to October 31.